Deepwater Jockey Club and Polo Club members celebrating the funding win, Brian Lana, left, Tricia Stack, Northern Tablelands MP Adam Marshall and Hamish Webb. A $20,000 State Government cash hit, delivered by Northern Tablelands MP Adam Marshall, has bumped polo into the local sports world with a brand new club set to score a home pitch in Deepwater. Mr Marshall announced the funding, from the government’s new Back to the Track fund, to build a polo ground in the centre of the Deepwater racecourse – and the locals are rearing to go with a big match plan for a homegrown sports kickoff. Deepwater horse breaker and inaugural polo club committeeman Patrick Herde says the funding is a winner for locals. Mr Marshall said the funding program was designed to support regional racing clubs to engage more horse groups and other clubs in their communities. 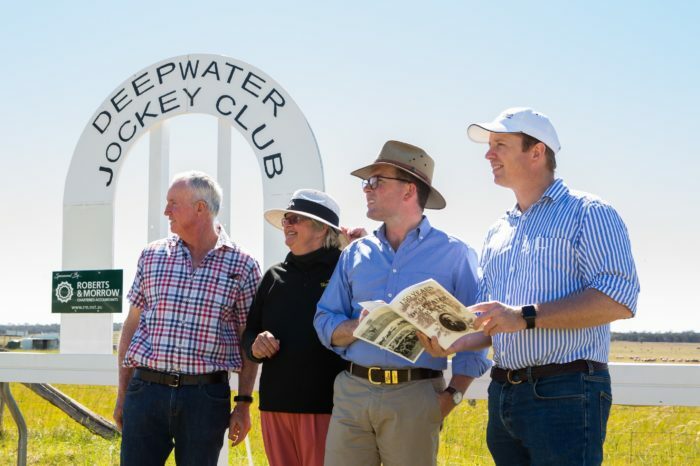 “The Deepwater Jockey Club and the newly formed local polo club are using this funding to develop a ground at the racecourse and forge a new sporting alliance that will increase the scope of sport locally,” Mr Marshall said. “The Deepwater Jockey Club is a beaut little club; a unique club with a unique character that last year won the Community Race Club of the Year title for NSW. It only races once a year, but what an event that is with thousands of racegoers attending the January event. Jockey Club Secretary/Treasurer Tricia Stack says the club is more than excited with the funding hit and says the big Deepwater race meeting on 19 January will be followed with some intense work from the polo group from a few days later to get the ground going. Mr Herde said working bees had already started to clean up the centre track area that will become the polo pitch but the big works to turn it from a weedy grass patch to a good green pitch would begin soon. “We’ll get some cattle manure in there because of the hard surface and hopefully find some locals with earthmoving equipment to get a start on the ground,” he said. “It will be a big community effort.